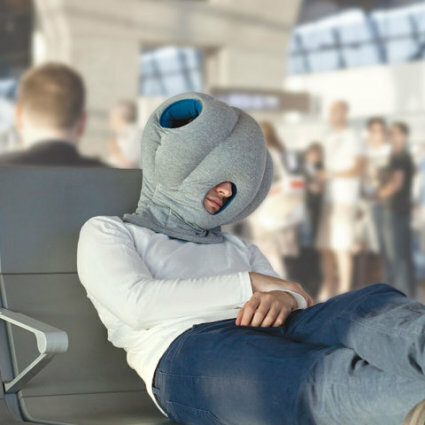 There's not much joy in travel these days, but I can see that this Power Nap Head Pillow might just make a positive dent in the otherwise dreaded train or plane ride. So what if other passengers stare at you and laugh.... You won't see or hear them! And if you can't afford a sleep pod for your office or dorm room, not to worry. The Power Nap Head Pillow is a perfect match for your desk or TV tray. You see those big holes in the side of the pillow are not for your big ears (silly! ); they're for your arms. 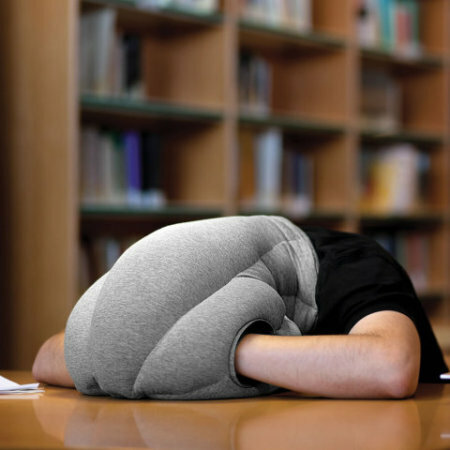 In fact, you can use the Power Nap Head Pillow (aka 'Ostrich Pillow') just about anywhere. Even in bed! It has a 4-inch layer of cushiony hypoallergenic bead stuffing that blocks out light, muffles ambient sound, and provides a cozy comfortable cocoon for your head, perfect for relaxation and sleep. But better set an alarm if you plan to make that next meeting! The Power Nap Head Pillow was designed by Kawamura-Ganjavian for Studio Banana Things and was kickstarted at Kickstarter. It comes in a soft case, suitable for travel and keeping the alien headwear clean. It is sold by Hammacher Schlemmer with a lifetime guarantee, and at Amazon.com, where it is known as the Ostrich Pillow. I am head-over-desk in love with this pillow! Catch you later!